I had a short bagging trip this week, precipitated by a visit from our niece, who fancied taking in a couple of Munros on a day-trip from Dundee. At the back of the corrie, there used to be a bit of clamber up the rocks beside the waterfall, but now there’s a beautifully engineered switch-back path. And, on the plateau itself, we encountered a cheerful bunch of path-layers, replacing the muddy rut of the old, eroded path with new stonework. Rags of cloud blew over as we reached the top of Mayar. We sat down at the cairn with no visibility, and then had the pleasure of watching a sunlit Glen Prosen evolve out of the mist during the course of the next few minutes. That turned out to be the pattern for most of the day—hot sunshine punctuated by dark, drifting, convective-looking cloud. We kept an anxious ear out for thunder, but the late afternoon brought clear skies instead of lightning. There’s a braided, eroded path that skirts the north shoulder of Little Driesh—trodden by generations of walkers determined to avoid the extra nine metres of reascent they’d incur by actually going over the top of that gently rounded summit on the way to Driesh. A strand of this path strays perilously close to the crags above Corrie Kilbo. There’s no advantage to the line it takes, and (from a distance) it certainly looks as if a small stumble could have you sliding down steep grass and then over the rocky edge before you knew what was happening. So we stuck to the broad swathe of even ground a few metres back from the edge. Across to Driesh, then, where there was practically a party atmosphere, with groups of people arriving and departing continuously. Cloud blew through, alternately obscuring and revealing Lochnagar to the north. Then down to join the Kilbo Path for the descent to Glen Doll. The Kilbo is a bit of a mystery. There are lots of things called Kilbo along its route as it crosses between Glen Prosen and Glen Doll—two Burns of Kilbo (one flowing south, the other north), Corrie Kilbo in the north above Glen Doll, and the Kilbo shieling at its southern end in Glen Prosen. 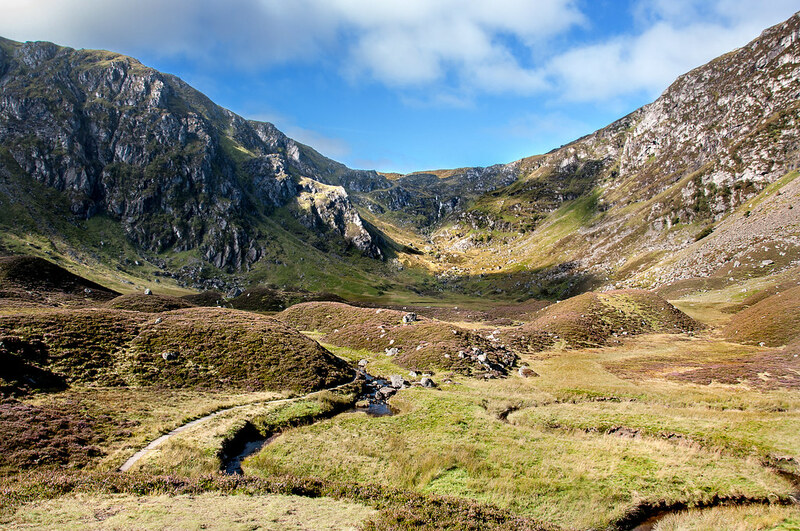 The name may come from Gaelic cuil bo, “cattle nook”, which could apply to either the northern corrie or the land around the southern shieling. And it follows two ridges with essentially the same name—the Shank of Drumwhallo as it rises out of Prosen, the Shank of Drumfollow as it descends into Doll. The “shank” bit is a Scots usage, referring to a ridge that descends from a hill. The “drum” bit is Gaelic druim, “ridge”, so the name is a bilingual tautology. As for the “whallo/follow” bit, David Dorward provides four possible Gaelic derivations in his book The Glens Of Angus —folach (“rank grass”), falamh (“empty”), falach (“concealment”) and falach (the genitive form of fail, “ring”). Like Dorward, anyone who has actually been on the plateau between the two Shanks will probably opt for “empty” as being the most likely derivation. But the real mystery is its absence from detailed early maps of the area—it’s not recorded on the Ordnance Survey six-inch maps of 1865 and 1902, both of which carefully record the other high tracks in the vicinity, the old droving routes that connected Glen Doll with Glen Callater and Glen Clova with Glen Muick. It was still missing from the Ordnance Survey one-inch as late as 1957. If it isn’t a remnant of one of these traditional Mounth roads, then it has the appearances of a well-engineered stalker’s path—its long, graded descent along the west side of Corrie Kilbo isn’t something that just happened by accident, for sure. Anyway, down we went into Corrie Kilbo, and the heat ramped up as the cloud thinned and we dropped out of the south wind. By the time we got to the car, it was 25ºC in Glen Doll, the warmest day of the year so far. There was a definite aroma of barbecue wafting over from the picnic area—but that seem to be coming mainly from exposed acres of pale Scottish flesh, turning slowly scarlet in the sun. Another lovely account. I followed up on the eskers. In NS, the “north mountain” of the Annapolis valley is said to be 90 km, a very long esker. Mainland NS does not have anything I’d consider a mountain, but local designation for a relatively small hill above the valley is firm. The NS government site about eskers was “not available” for my further edification. The eskers in Corrie Fee are about three metres high, and chopped up into little sausage shapes by (I’m guessing) the post-glacial Fee Burn cutting through them. We were talking so much about eskers as we walked through the corrie I clean forgot to take a photo of them. But I found a nice picture on Flickr here, taken from close to the mouth of the corrie and looking up towards the waterfall that appears in one of my photos. Deeper in the corrie, the path rises to the top of an esker with boggy ground on either side. My forty-five year recollection is that there are other eskers in Glen Doll proper, now covered by the forestry plantations.